Details of the Miniature Golf courses we've played on our Crazy World of Minigolf Tour since September 2006. Below is the list of the 862 Miniature Golf courses visited on our Crazy World of Minigolf Tour to date. 824 of them have been in the British Isles. In total we've been able to play 504 of them as many have been found to be abandoned, closed or derelict. Some courses that were closed on our original visit have since been played. On our travels we've seen the good, the bad and the ugly of minigolf courses, but feel that each and every one of them is beautiful in its own right. The game of minigolf is one of fun and frustration and mixes skill and luck to tackle the obstacles set-up to trip you up and trick you as you play. We'd like to thank course owners, operators and suppliers everywhere for building, running and maintaining Miniature Golf courses of all shapes, sizes and types and look forward to playing and revisiting courses for more minigolfing fun in the future. You can now click through from the list below to the webpage on the Ham and Egger Files detailing our visit to the course. Please be aware that courses come and go and this list is not a 'live' list of Miniature Golf courses. On our travels we've found 300 or so of the 800+ courses to be unplayable for one reason or another. If you find that a course is no longer there, or has significantly changed, please let us know by leaving a comment. 1 Southsea (Treasure Island) - Adventure Golf (Victory Trail) - RICHARD WINS A FREE GAME ON THE TOP HOLE - Revisited 30th September 2011 - RICHARD WINS ANOTHER FREE GAME ON THE TOP HOLE! - Revisited 7th August 2015 - RICHARD WINS ANOTHER FREE GAME ON THE TOP HOLE!! - Revisited 30th September 2016 - RICHARD WINS ANOTHER FREE GAME ON THE TOP HOLE!!! 2 Southsea (Treasure Island) - Adventure Golf (Warrior Trail) - Revisited 30th September 2011 - Revisited 7th August 2015 - Revisited 30th September 2016 - EMILY WINS A FREE GAME ON THE TOP HOLE! 43 Hastings (Planet Hastings) - Minigolf - Update: May 2011, now an Outdoor Laser Tag Arena! 53 Felixstowe (Sea Front) - Putting Green - Update April 2010. Now removed to make way for Donkey Rides! 97 Maidenhead (Riverside Gardens) - 18-hole Eternit - revisited on 10/10/10 at 9pm! 109 Southbourne/Fisherman's Walk (Cafe Riva) - Crazy Golf - Update: July 2013 - the Crazy Golf course has been refurbished and is now felted. 159 West Bromwich (Sandwell Valley Park) - Crazy Golf (Eternit) - Update: 19th April 2010 - The 18-hole Eternit course has been scrapped, with a new Swedish Felt course to take its place - Update: 23rd January 2011 - A new 9-hole Swedish Felt B-Run is there now. 241 Woodhall Spa (Bainland Country Park) - 5 Star Crazy Golf - RICHARD SCORES A 'PERFECT' ROUND, WITH 9 HOLES-IN-ONE IN A ROW! 300 Telford (Wonderland at Telford Town Park) - Crazy Golf - Also the 500th Minigolf Course Visited Overall! 324 London (London Golf Show at Earls Court) - UrbanCrazy "Signature Course" - 6-hole Portable Crazy Golf. Also played the new PongCrazy table tennis mini-golf game! --- Brighton (Pier) - Crazy Golf - 2008 Closed for two years and now a Coconut Shy! 15 Felixstowe (Sea Front) - new build (not yet complete as at May 2009) - Update December 2009 - Course frames were removed on last visit Update April 2010 - No sign of course. On the same plot as the Donkey Rides! 20 Warrington (Orford Park) - Now flower beds!? 41 Leyland (Worden Park) - Mini Golf - Open weekends at 11am but was closed when we visited on a Sunday!? 43 Weymouth (Riviera Hotel) - Crazy Golf - Visited again in October 2010 - now the Hotel and Course are derelict! 50 Dunstable (Party in the Park Event) - Mini Golf Range - was advertised for the event, but not actually at the event!? --- Biggleswade, Beds (American Golf Driving Range) - 'Minigolf', but not as we know it! 53 Brentwood (Brentwood Golf Centre/King George Playing Field) - Crazy Golf - Course only open 11am-3pm each day. Update August 2014: Course removed and replaced with a new Adventure Golf course. 57 Hornchurch (Harrow Lodge Park) - Minigolf/Miniature Golf - Did not exist!? 58 Hornchurch (Haynes Park) - Minigolf/Miniature Golf - Did not exist!? 59 Romford (Harold Wood Park) - Mini Golf - Did not exist!? 62 Wendens Ambo (The Bell Pub) - Mini Golf - Did not exist despite web listing!? 65 Newport (Big Splash) - We were a week too early to play the portable course! 66 Smeeth (The Woolpack Inn) - Crazy Golf - We arrived at the pub at 11am, but it didn't open until 12pm! 68 Folkestone (Seafront) - 18-holes Art Installation - three beach huts made from the old Rotunda Arnold Palmer Putting Course!!! 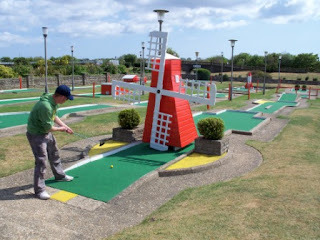 69 Folkestone (Martello Tower 3) - Mini Golf, but was a Pitch & Putt which we had no time to play. According to Thisisfolkestone.co.uk "Up until 1940, the first floor of the tower was used as a clubhouse for a miniature golf course, and the word 'GOLF' painted in large white letters around the outer wall." 74 Rye - Putting Course - Closed for the day. Update: October 2014 - revisited and still not played! ---80 Weymouth (Riviera Hotel, Bowleaze Cove) - Crazy Golf - both the hotel and the course are derelict! 94 West Bromwich (Sandwell Valley Park) - Mini Golf - Believed to be a Pitch & Putt. There was a sign on a gate, but no sign of the course!? - Luton (Old Bedford Road) - Feature Golf Lawn - £625,000 to play it! - Aintree (Harrow Drive Playing Fields) - Crazy Golf - Dug Up! 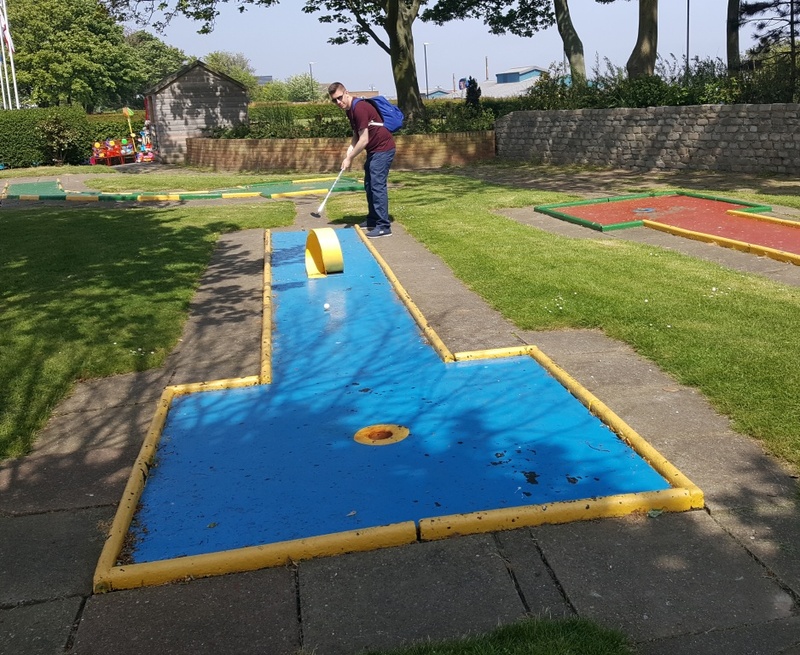 - Skegness (North Shore Caravan Park) - Mini Golf - Pitch & Putt - Also home to "The Pitch And Putt Inn"
- Loch Lomond, Scotland (Muddy Good Fun) - Crazy Golf - Didn't realise there was a course there until I read the leaflet when I got home! - Yattendon (Yattendon & Frilsham Fete) - Crazy Golf - Course advertised, but no course at the event. There was however a Christmas Tree Throwing Competition! - Bath - (Combe Grove Manor, Brassknocker Hill, Monkton Combe) - Minigolf - Could not find it! 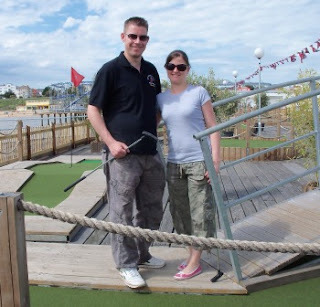 - Hambrook, Bristol (Bristol Golf Centre) – Pirate Bay Adventure Golf - Could not find it!? 761 Oldham (Bishops Park) - Pitch and Putt - there was a bull loose between the 1st tee and the 9th hole!!! * Due to closure, flooding, dereliction, or other a number of other reasons! Give the Crazy World of Minigolf Tour a Like on Facebook, watch our YouTube channel and follow us on Twitter @putting_gott and @Ems_Lems. Please do sign-up to receive our miniature golf newsletter too. Today marks the sixth year of me and Emily's Crazy World of Minigolf Tour! We've visited 509 courses in a variety of types since the 30th September 2006! Many thanks to everyone for the tips of where to play and for Tim 'Ace Man' Davies for creating MiniatureGolfer.com. It's been brilliant visiting so many different places in the UK (and a few overseas) and meeting some great people, many of whom have become good friends. The 600th miniature golf course visited on our Crazy World of Minigolf Tour was the Jurassic Adventure Golf course at the Santa-Fe Fun Park in Swanage, Dorset on Sunday 31st May!